Actual issue reporting should still happen via the Feedback Tracker of course. Thank you! Sure, here you go. This is variant is for people with both their own head models and uniforms in mod In head model Create empty View Pilot (you should also add "LODNoShadow=1" property). Create ShadowVolume 0.000 LOD and leave Object Builder open. In character model In first Shadow LOD (ShadowVolume 0.000), you can cut and paste whole head mesh and put it head model. "Head" mesh in character model looks usually like this. Head shadow mesh in head model should look like this then. Then you can take "bysta" proxy from e.g. first visual LOD and paste it into View Pilot. Result should look like this. 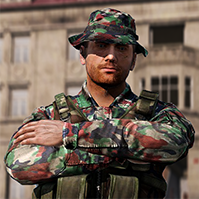 And this is variant for people with just uniforms in mod In character model In first Shadow LOD (ShadowVolume 0.000), you have to delete "head" mesh - usually it's even with neck, you should delete that too. Make sure that your geometry is closed. "Head" mesh in character model looks usually like this. Then you can take "bysta" proxy from e.g. first visual LOD and paste it into View Pilot. Result should look like this. You are now done.